A fertile valley running along the banks of the River Tea, lying between the Paradanta and Galleiro Hills, in the region of O Condado, and rich in archaeological remains from various periods. This is a land that is home to fine musicians and curious traditions such as that of the Bridge of los Remedios, related to easy childbirth, or the animist cults inspired by the huge crags of A Picaraña. 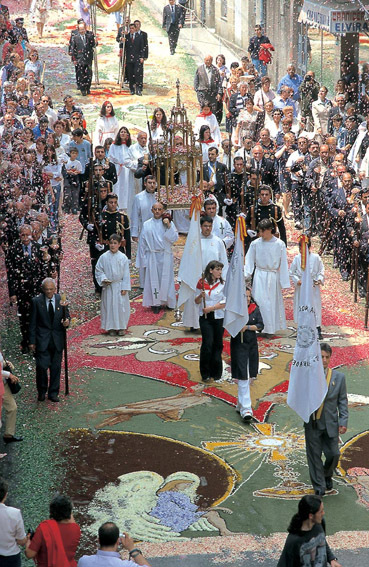 The area’s best- known festival, Corpus Christi, is held during the weekend following “Corpus Christi”, and is famous for its elaborate floral carpets. 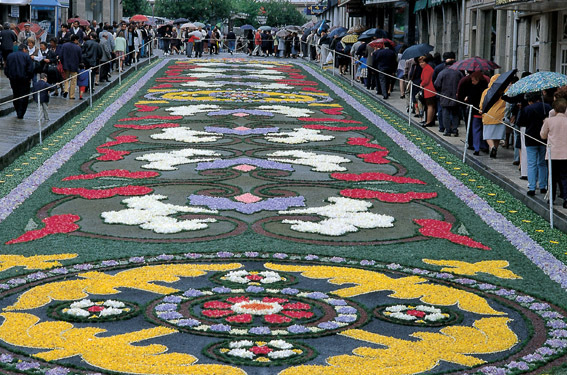 This is a delicate and sadly ephemeral art form, whose intricate multicoloured and geometrical shapes are the result of a whole night’s work in which the whole town is involved, in readiness for the solemn procession at noon the following day.